Breaking News: IPVanish lied about their logging policies (also to us). You can read everything about it in this article. We do not recommend to use them anymore. IPVanish stands out from other VPN companies out there for a number of reasons. IPVanish was only established in 2012 but it has already proven itself to be a top-notch VPN service. IPVanish offers high-quality VPN connections as well as the best network speeds. IPVanish offers UK Servers and IPs from the following UK cities: Belfast, London, Liverpool, Manchester, Glasgow, Nottingham. IPVanish has earned high praises from various organizations and VPN users over the years. The VPN service can give users the ability to surf the web anonymously and access normally blocked websites. IPVanish is considered by many as a VPN service that is better than other VPN services. Or is it? We have reviewed IPVanish and in this article, we will detail the numerous features that are loaded with the IPVanish VPN service. Continue reading to learn more about IPVanish. For IPVanish, privacy is a key element to making the VPN service truly trustworthy and reliable. IPVanish claims to offer the real purpose of a VPN and that is to provide privacy and anonymity to users regardless of where they are located. IPVanish offers an easy-to-use software that facilitate VPN connections thru the VPN service’s Tier-1 network. IPVanish is compatible with the most popular operating systems and devices. To connect to an IPVanish server, users need to run the VPN software on a Windows (7 or later), Mac OSX (10.10x), iOS (8.x), Android (ICS and up) or Ubuntu machine. For older versions of operating systems, users will have to manually setup their machines to get the VPN service to work. The VPN service will also work on Windows Phone, Chromebook, SmartTVs, multimedia devices and DD-WRT / Tomato flashed routers. IPVanish offers support to standard protocols including PPTP, L2TP/IPSec and OpenVPN which is the most secure protocol. IPVanish provides unbreakable encryptions of up to 256bit through its supported security protocols. IPVanish offers a single VPN plan but if you’d like to avail of the discounted rates, you’ll have to subscribe to a multi-month term. A month of IPVanish subscription costs $10.00. Subscribe to a 3-month IPVanish plan and save 25% or pay $26.99 only. The 1-year subscription offers the biggest savings with a 46% off discount. Purchase one year of IPVanish VPN services and pay $77.99 only. All new accounts get a 7-day money back guarantee. If the subscribers are not happy with the service, they can simply request a refund during the 7-days grace period to cancel the subscription. At this point, IPVanish is only offering a free trial to users who download the mobile app on their iOS devices. The free trial VPN access is only good for a day. Note that free trial accounts will automatically renew to a monthly subscription when the trial account expires unless the auto-renew account setting is turned off. IPVanish accepts payment made via major credit cards, PayPal, Bitcoin, GiroPay (Germany), AliPay (China), CashU (Bahrain), Mister Cash (Belgium), PaySafeCard (Austria), POLi (Australia), SOFORT Banking (Austria), Boleto Bancario (Brazil), DineroMail 7Eleven (Mexico), DineroMail Oxxo (Mexico), DineroMail Bank Transfer (Mexico), DineroMail ServiPag (Chile), Przelewy24 (Poland), IDEAL (Netherlands), Elektronisches Lastschriftverfahren (Germany) and EPS (Austria). Not all payment methods can be used to pay for recurring subscriptions though. Users will have to renew their subscriptions every now and then if they use payment methods such as Bitcoin or Giropay. IPVanish is proud of to be the only true Tier-1 VPN provider in the market. The VPN company owns and runs their VPN servers. From a technical perspective, operating its own VPN infrastructure is one of IPVanish’s advantages against its competitors. IPVanish through their Tier-1 VPN network can offer unmatched speed and bandwidth. IPVanish is one of the fastest growing VPN network in the world. 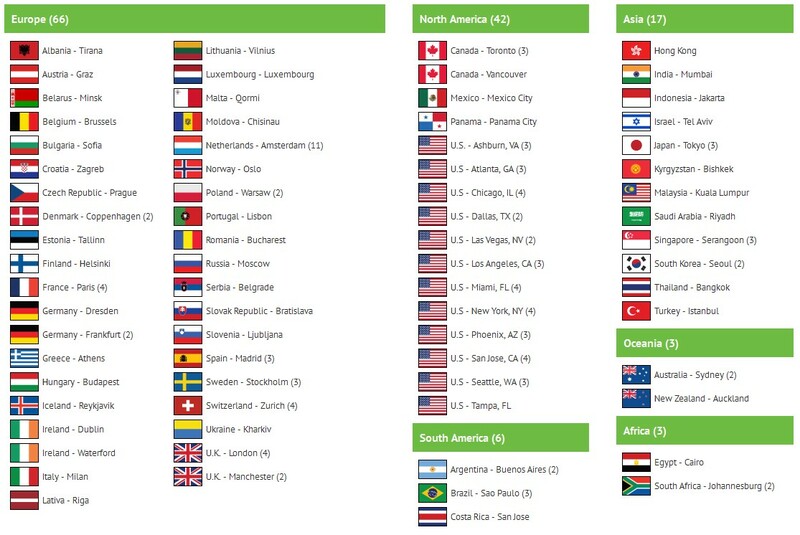 IPVanish has servers strategically located in 60 different countries. Over 40,000 IPs are available to mask users’ actual IP addresses. Some of the server locations include Canada, UK, US, Japan, Hong Kong, Sweden, Switzerland, Italy, France, South Korea, Egypt, Brazil, Australia, New Zealand and the Netherlands. Check out the complete list of server locations here. Argentina, Australia, Belgium, Brazil, Bulgaria, Costa Rica, Denmark, Germany, Estonia, Finland, France, Greece, Great Britain, Hong Kong, India, Indonesia, Ireland, Iceland, Italy, Japan, Canada, Croatia, Latvia, Lithuania, Luxembourg, Malaysia, Mexico, Moldova, New Zealand, Netherlands, Norway, Austria, Panama, Poland, Portugal, Romania, Russia, Saudi Arabia, Sweden, Switzerland, Singapore, Slovakia, Spain, South Africa, South Korea, Thailand, Turkey, Ukraine and the United States. When it comes to speed, IPVanish easily beats its competition. At first, we thought IPVanish’s claim of being the fastest VPN network in the world is only a marketing ploy. But to our surprise when we tested it out! IPVanish outperformed other top VPN service providers when we tested for speed and stability. IPVanish does not only provide superior speed performance with its VPN service, but it also offers courteous, prompt and reliable customer support. The VPN’s website is also loaded with tons of support topics with detailed and easy to understand answers to most questions. Overall, we like IPVanish’s performance. Hands down to IPVanish for offering great features: reliable customer support, great speed, unlimited bandwidth, allows P2P / torrenting, proprietary VPN network and even their VPN product is competitively priced. We didn’t really experience any technical issues while using IPVanish. We too have high praises for IPVanish – we simply love the VPN service in all honestly! What we’re just concerned about is that the VPN company is based in the United States. We all know how powerful the US government is. IPVanish says it will comply with US laws to stay in business. The government could simply pressure the VPN company to hand over consumer data. We just hope that IPVanish is truly dedicated to providing anonymity and privacy on the internet. Update: IPVanish lied about their Zero-Logs policy, we do not recommend to use them anymore! Absolutely terrible. Save your money and go with another provider. Typically I get download speed of between 0-1KB per second. Yes that is not a typing mistake it really is less than 1KB per second. So slow that I cannot even open some text pages let alone stream video. And I am on optical fibre with normal speed of 25-30MB when not connected to IPVanish. I went to the IPVanish FAQ section and followed all their suggestions of trying to get a better speed connection but nothing seemed to work. I then contacted IPVanish customer support and received two separate replies suggesting the same things as on their FAQ section. After replying to both emails stating that I had already tried the suggestions on the FAQ sections (as stated in my original email to IPVanish), I received an email simply stating “We cannot help you further with your problem” without offering any other suggestions or assistance. Unbelievable! And so unprofessional. For a better service and one that can at least conduct itself in a professional manner don’t go with IPVanish and sign up with another provider.